This pair of men's mittens is a great weight. Not too heavy but still warm and sturdy. They are a solid dark brown with brown leather sewn into the palm to help grip the steering wheel, or better yet....a shovel! 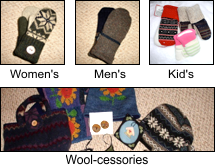 They are lined with high quality fleece like all of our mittens.